GREENFIELD, MASSACHUSETTS (2017) --- Blue Hand Books Collective in Western Massachusetts has just released a new book by first-time author Charles Grolla (Ojibwe) of Bemidji, Minnesota. His Ojibwe name is Ogimaagiizhig Odoodeman Adikwan. “The purpose of this new book is to make sure this beautiful game is handed down to new generations,” Ojibwe author Charles Grolla said. “Traditionally played by men only, it’s probably our oldest Ojibwe men’s game, and moccasin game has been and is still a big part of our Ojibwe culture even to this day. “The Ojibwe style of moccasin game is my understanding and what I learned growing up playing this beautiful game, mainly on the Red Lake Reservation,” Grolla said. Ojibwe style moccasin game is still played on the Red Lake, Mille Lacs, Nett Lake, White Earth, Leech Lake, Roseau River, and Lac La Croix Reservations. Tournaments are conducted during pow-wows and celebrations on reservations. 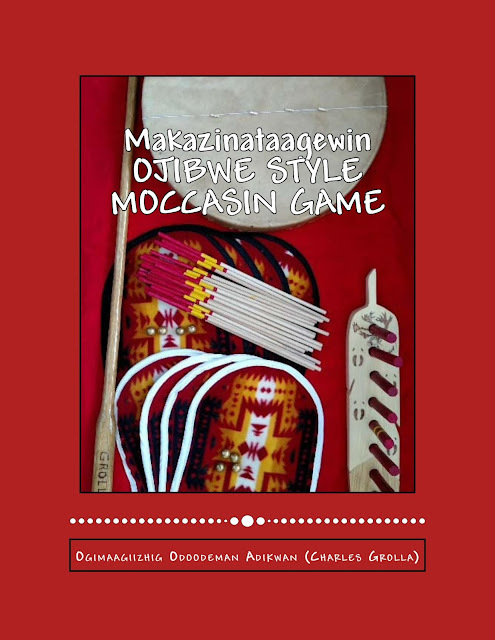 The new book includes a glossary of Ojibwe terms relating to this sacred game and the history of how “makwa” bear gave it to the Ojibwe people. Charles Grolla’s Ojibwe name is Ogimaagiizhig (Boss of the Sky) and he is of the Adik (Caribou) clan or totem. He is an enrolled member of the Bois Forte reservation in Minnesota and was raised mainly on the Red Lake reservation in Minnesota. While growing up in the Bikwaakwaang (West End) area of the Red Lake reservation, Charles became a contending player of Ojibwe style moccasin game before the age of 14. In 2016 Minnesota Indian Education awarded him “Ojibwe Teacher of the Year” for his many accomplishments during his six years of teaching high school Ojibwe language classes. Along with teaching high school, he volunteers once a week to teach moccasin game to the community. MEDIA CONTACT: interview and photos will be provided upon request.